Enjoy tinkering, making and crafting? Pop along to an open day at the London Hackspace on 6 February to meet like-fingered people. Don't be put off by the name. London Hackspace isn't just for coding nerds. It's a place where anyone of a crafty bent can tinker, tailor, solder and sew - a non-profit, community-run space where 'people who make things can come to share tools and knowledge'. It's a bit like in the A Team, when the once-again-incarcerated foursome would build an armoured vehicle out of a mattress and a toilet brush...but without Colonel Decker's armed goons guarding the entrance. 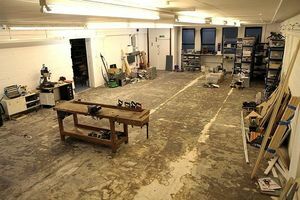 Back in the real world, the Hackspace folk have just expanded their Hoxton premises. An open day beckons on Sunday 6 February to celebrate. Anyone can drop by to check out the facilities and talk to regular 'makers' (as those who indulge in the creative arts style themselves). Members and visitors get access to a metal and wood-working workshop, a 3D printer, a laser cutter, electronics equipment and components, desk space, sewing machines, and much more. The open day runs from 1pm on 6 Feb at Unit 24, Cremer Business Centre, 37 Cremer Street, London, E2 8HD.